On our way from the city of Renhuai to Maotai, we could smell the fragrance of wine becoming stronger as we drew nearer. We found wine jars and large wine containers in front of every house on both sides of the road. A local official who accompanies us said that the wine made by households here is mainly sold to wine factories in neighboring Sichuan Province. If a family can produce two tons of wine, they'll have more than enough money to support themselves for the rest of their lives. The world renowned Maotai Wine Company takes up around two thirds of the town's area and over one sixth of the town's population to work for the company. It is believed that Maotai possesses a unique climate and vegetation that contributes to the unparalleled taste of the drink. In the 1970s, the local government attempted to build another Maotai wine company in nearby Zunyi in order to increase the drink's production. They employed the exact same materials Maotai wine is made from, such as sorghum and water from the Chishui River. But the factory failed to make wine of the same quality. People say the unique geographical location and climate accountted for this. Even today, the Maotai Wine Company produces only twenty thousand tons of wine a year. In addition to the Maotai Wine Company, the town also boasts over 100 private wine factories. Most of them developed from workshops. Since Maotai wine is higher in price and limited in quantity, only a small number of people in China have the chance to drink it. However, private wine factories in Maotai can produce wine of almost the same quality as Maotai Wine Company enjoys, and at a much cheaper price thanks to the favorable geographical locations and traditional wine-making skills which are the same as Maotai Wine Company. Wu Jiagao, owner of a private wine factory told us that his factory used to have only ten employees, but now it has 200. The wine it produces is not only well received in Guizhou, but also all over China. 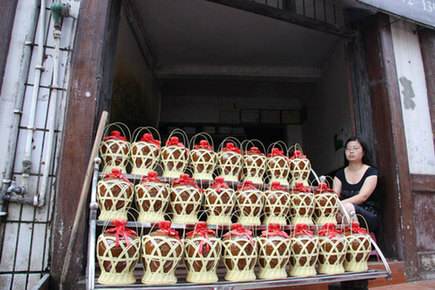 Numerous small wine shops line the streets of Maotai. With white walls and black-tiled roofs, the shops are made in the traditional Hui style. Their wine, home-made or bought from small family wine workshops, is contained in jars and sold at prices ranging from 20 to 200 yuan per kilogram. More often than not, we saw the shop owners, leisurely sitting on cane chairs or lying on a sofa, selling their wine. Its hard to tell if they are drunk from their quality wine or from their easy life.